This example shows how to run a continuous simulation with InfoSWMM H2OMap SWMM InfoSWMM SA using a long-term rainfall record. 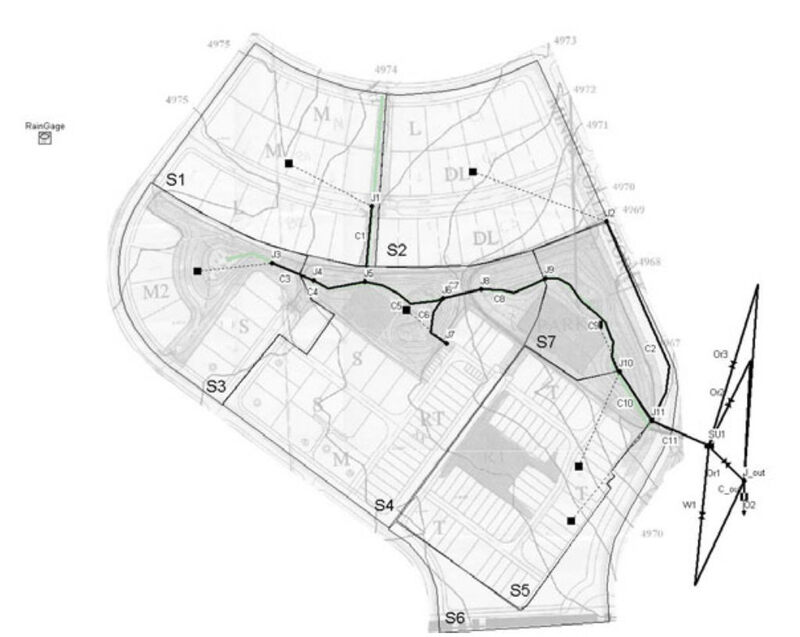 It will analyze the performance of the drainage system and BMP detention pond for the 29 acre residential site designed in Example 3. The multipurpose pond was designed to detain a water quality capture volume (WQCV) and control peak post-development release rates to their pre-development levels for the 2-yr, 10-yr and 100-yr design storms. This model will be re-run using a set of monthly average evaporation rates and a continuous precipitation record, so that its behavior over a 10year period can be studied. The use of InfoSWMM H2OMap SWMM InfoSWMM SA”s Output Statistics Manager tool for analyzing the results of a continuous simulation will also be demonstrated. Because it only takes a few steps to set up Example 3 for a continuous simulation, the bulk of this chapter will focus on analyzing the results produced by the simulation. Continuous simulation is important because it allows actual historic data to be used to analyze the performance of drainage systems and their components. Drainage systems are typically designed using synthetic design storms. These single event design storms do not take into account varying patterns of rainfall duration and intensity, variation of time between storms, changing antecedent soil and storage conditions within the watershed, and the effect of evaporation. Continuous simulation considers all of these factors and allows for a more accurate and robust comparison of the long-term water balance and hydrologic performance of alternative stormwater management scenarios. Was the flow target used to design the detention pond adequate? How significant is evaporation within the overall system water balance? How significant are antecedent conditions in affecting system behavior? How effective is the detention pond in reducing peak discharges? How effective is the pond in capturing the majority of runoff events within its water quality control volume? What statistical properties of the rainfall record set it apart from the design storms used previously? Continuous or long term simulation involves the simulation of multiple events over a continuous period of months to years. In single-event simulation the rainfall record is first analyzed separately to create an Intensity-Duration-Frequency (IDF) curve from which design storms can be chosen; these design storms have a specific duration and return period (e.g. the 2-hr 10-yr design storm) and are used within InfoSWMM H2OMap SWMM InfoSWMM SA to generate a single runoff hydrograph for design. In comparison, continuous simulation applies a long term record of rainfall directly within InfoSWMM H2OMap SWMM InfoSWMM SA to generate a long-term record of simulated runoff; statistical analysis is then run on this generated record to characterize the long-term performance and achieve a final design. It is advantageous to use continuous simulation because it accounts for antecedent soil conditions and other initial values of variables, such as the initial water level in storage units, which affect the response of the drainage system to individual storm events. It also allows the representation of actual storm events of varying magnitudes, durations, and occurrence intervals. The main disadvantages of continuous simulation are the additional computation time required and the lack of high quality, long-term rainfall records for many locations. 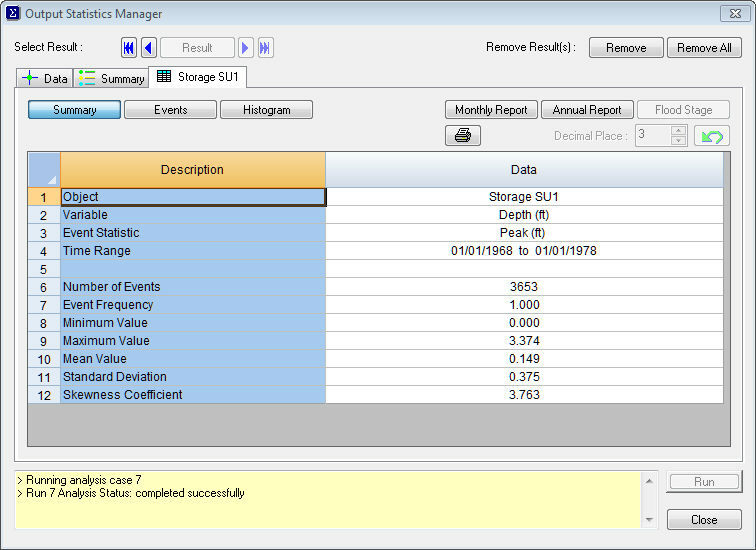 InfoSWMM H2OMap SWMM InfoSWMM SA can utilize long-term rainfall data stored in external files. The program recognizes several different file formats for these data: (1) the National Climatic Data Center (NCDC) DSI-3240 format for hourly rainfall and the DSI-3260 format for 15 min rainfall (both available from www.ncdc.noaa.gov/oa/ncdc.html), (2) HLY03 and HLY21 formats for hourly rainfall and the FIF21 format for 15 min rainfall at Canadian stations, available from Environment Canada (EC) at www.climate.weatheroffice.ec.gc.ca, and (3) a standard user-prepared format as described in the “Rain Gages” topic in the InfoSWMM H2OMap SWMM InfoSWMM SA on-line help. The quality and quantity of the record will vary from station to station, but it is unusual to find long precipitation records with no missing or incorrect data. It is very important to check the quality of records before using them. Single event simulations are usually insensitive to the evaporation rate. Thus, evaporation is typically neglected when a single rainfall event or a synthetic storm is simulated. However, this process is more significant when a continuous simulation is performed because it is through evaporation that depression storage is recovered and water levels in extended detention and wet ponds are reduced; thus it becomes an important component of the overall water budget. Several options are available for representing evaporation data in InfoSWMM, including: (1) a single constant value, (2) historical daily average values stored in an external file, (3) a time series when high temporal resolution is available, and (4) monthly averages. Evaporation data are supplied on the Evaporation tab of InfoSWMM H2OMap SWMM InfoSWMM SA’s Climatology Data Editor. Although conceptually evaporation should also affect the recovery of infiltration capacity within the pervious areas of the watershed, InfoSWMM H2OMap SWMM InfoSWMM SA’s infiltration models do not explicitly take it into account. Instead, they employ simple empirical functions for this purpose. The Horton infiltration model, used in the examples throughout this manual, employs an exponential function to restore infiltration capacity during dry periods. The rate coefficient in this function is inversely proportional to the soil’s drying time, i.e., the number of days it takes a saturated soil to drain completely. A drying time of 7 days is used for the site being analyzed, which is a typical value for the silt loam soil that is assumed to cover the site (see Example 1). Analysis Variable Threshold – the minimum value of the variable under analysis that must be exceeded for a time period to be included in an event. Event Volume Threshold – the minimum flow volume (or rainfall volume) that must be exceeded for a result to be counted as part of an event. Separation Time – the minimum amount of time that must occur between the end of one event and the start of the next event. Events with fewer hours are combined together. This value applies only to events formed from consecutive reporting periods, not to daily, monthly or annual event periods. 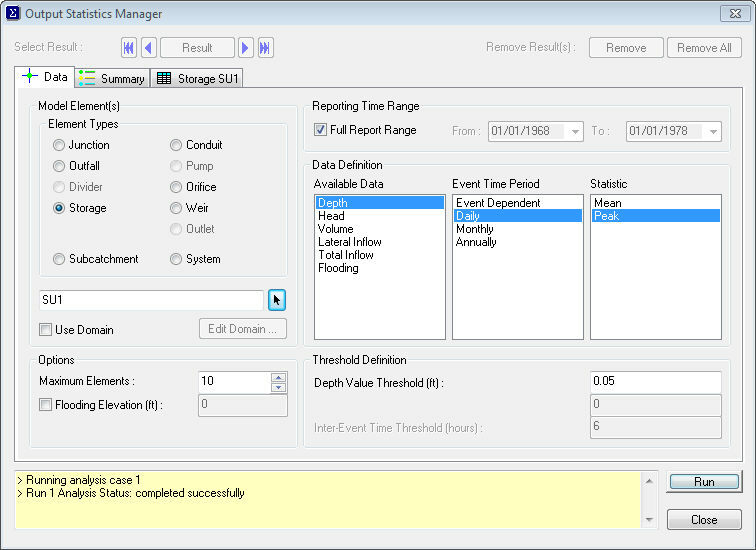 It then computes a user-specified event statistic for the analysis variable over all reporting time periods that fall within each event period. This could be the event mean value, the peak value, the total volume, etc. Thus each event is characterized by a single value for whatever variable is being analyzed. Summary statistics for the event values over the entire set of events are then computed. These statistics include the maximum, minimum, mean, standard deviation and skewness. Finally a frequency analysis for the collection of event values is performed. The events are rank ordered by value in a table that lists the event’s date, its duration, its event value, its cumulative exceedance frequency, and estimated return period. A histogram of event values and a cumulative frequency plot of these values are also produced. 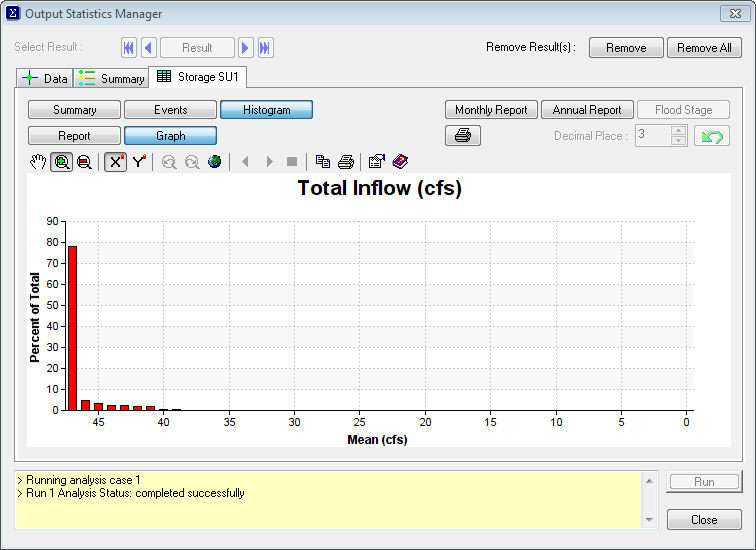 As an example, a typical query might ask InfoSWMM H2OMap SWMM InfoSWMM SA to segregate the output record of flows discharged from a particular outfall into periods where the flow is above 0.05 cfs and there are at least 6 hours between events, and compute the summary statistics and frequency distribution of the peak flows within these events. In this example evaporation is supplied as monthly averages in units of in/day. Table 9-1 shows the monthly averages for the city of Fort Collins that are used in this example; the values were obtained from the Western Regional Climate Center (www.wrcc.dri.edu/htmlfiles/westevap.final.html #colorado). The first row shows the total monthly pan evaporation in inches. These amounts are adjusted in the second row by multiplying them by 0.70 to more closely estimate the evaporation from naturally existing surfaces, as proposed by Bedient and Huber (2002). Finally, the third row shows the daily rates obtained by dividing the monthly totals by the number of days in each month. Note that total values from December to February are 0.00. Typically this means that the station does not measure pan evaporation during these months. The values in the last row are entered on the Evaporation tab of InfoSWMM’s Climatology Data Editor. Evaporation from the surface of the site’s detention pond should also be accounted for. 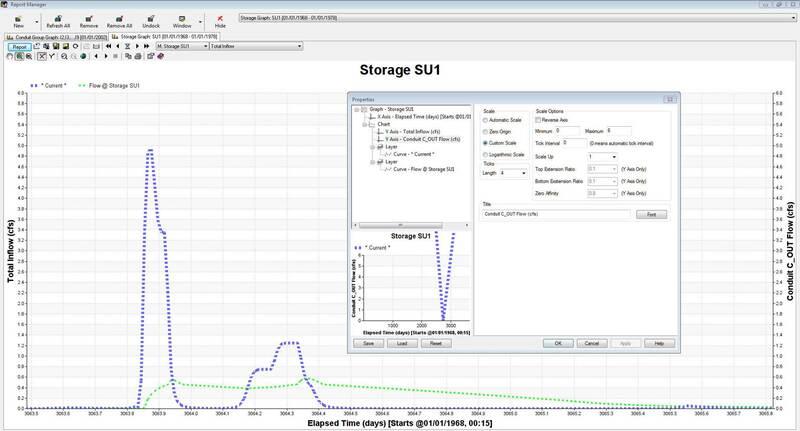 To do this, open up the Property Editor for the storage unit node SU1 and enter a value of 1.0 for the Evaporation Factor property. The 30-year hourly rainfall record provided for Fort Collins is linked into the model as explained in the sidebar “How to Load a Continuous Rainfall File into InfoSWMM H2OMap SWMM InfoSWMM SA. The name of this file is Record.dat. Because this file is from the NCDC and adheres to the DSI-3240 format there is no need to alter the Rain Format, Rain Interval, or Rain Units properties of the model’s single rain gage. The Station ID property can be set to the ID associated with the data’s recording station which is 053005. The period of record for these rain data extends from 1949 to 1979, but only the 10 year period from 1968 to 1978 will be simulated. Figure 9-2 shows the precipitation record for this period of time. There are many factors to consider when selecting a sub-period of a long-term record, such as the quality of the data it contains and how representative it is of both the overall record and of current rainfall patterns. A continuous precipitation record can be supplied to InfoSWMM H2OMap SWMM InfoSWMM SA by using an external file as the data source. What follows are the steps used to identify such a file to InfoSWMM H2OMap SWMM InfoSWMM SA. 1. Open the Property Editor of the Rain Gage that will use the rainfall data and select FILE as the Data Source. 2. Click the ellipsis button in the File Name field. Navigate through your files and select the file containing the continuous rainfall data. 3. If the file is in the User-Prepared format then the Rain Format and the Rain Interval of the data in the file must be specified in the Property Editor. 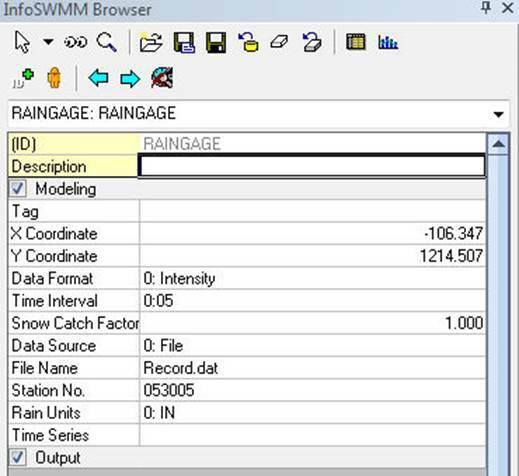 For data from NCDC or EC files, SWMM automatically determines the appropriate rain format and rain interval to use, and will override any values specified for these properties in the editor. 4. Provide an entry for the Station ID field in the Property Editor. For NCDC and EC files any identifier can be used – it need not be the station ID used in the file. However for User-Prepared files it must correspond to an ID that appears in the file since these files can contain data for more than one station. 5. If a User-Prepared rainfall file is being used then the correct Rain Units for the rain depths in the file (inches or millimeters) must be specified. For NCDC and EC data files this property is determined automatically. 6. 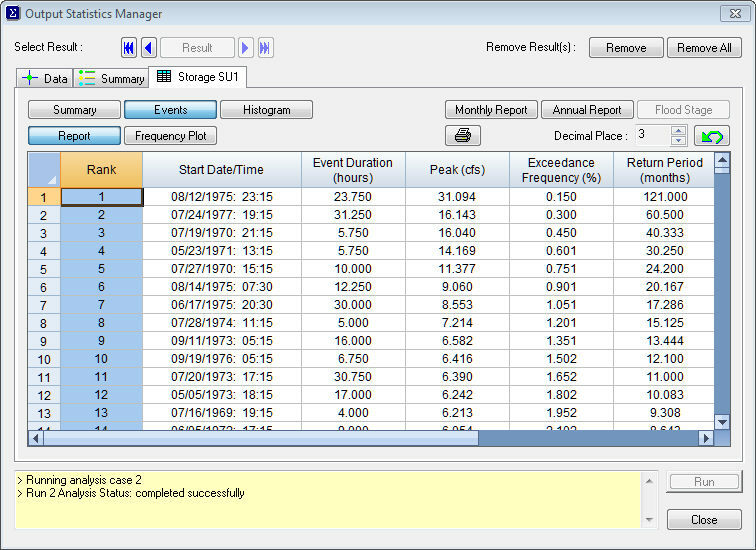 Finally, specify the desired start and end analysis dates in the Simulation Options Editor based on the rainfall record. These dates must fall within the period of record. Time periods that fall outside those contained in the rainfall file will have no rainfall associated with them. The Rain Gage Property Editor for Example 9 is shown in the figure below. Note that the entry in the File Name property will be different depending on where you installed the rainfall file for this example on your computer’s file system. Finally it is necessary to change some of the original simulation options so that the correct period of rainfall record is simulated and a manageable amount of output is generated. Using the Datestab of the Simulation Options dialog, both the simulation start date and reporting start date are set to 01/01/1968. The simulation ending date is set to 01/01/1978. Next the following changes are made on the Time Steps tab of the dialog: reporting step = 15 minutes, wet weather runoff step = 15 minutes, dry weather runoff step = 6 hours, and routing step = 60 sec. Note that these time steps are longer than those used in most of the previous examples. This is done to cut down on the amount of time needed to run the simulation and on the amount of output results that are produced. The resulting scenario is named EX9-CONTINUOUS_SIMULATION. Running this model will take about three to five minutes on a 2.41 GHz computer. Most of this time is consumed by the flow routing computations. In general, the run time will depend on the complexity of the watershed being modeled, the routing method employed and the size of the routing time step used. The larger the time steps, the faster the simulation but the less detailed the results. If accurate simulation of peak flows on small watersheds is desired, then smaller time steps must be used. One way to determine the proper time step is to simulate a single event at different time steps, then choose the longest time step that produces the desired resolution in the hydrograph but still produces a stable solution with acceptable continuity error. The run time for this example could be cut in half if Kinematic Wave routing were used instead of Dynamic Wave routing. This is a viable alternative for long-term simulations if one is willing to ignore possible backwater effects and pressurized flows, and if the drainage network is not bifurcated. InfoSWMM also has another feature that can possibly reduce run times. This is the Skip Steady State Period option that appears on the Advanced tab of the Simulation Options dialog. When this option is used the simulation skips over periods of time when there is no runoff and no changes in flow. The criteria used to determine when such periods exist are quite stringent, and for this example it resulted in a negligible savings in run time. 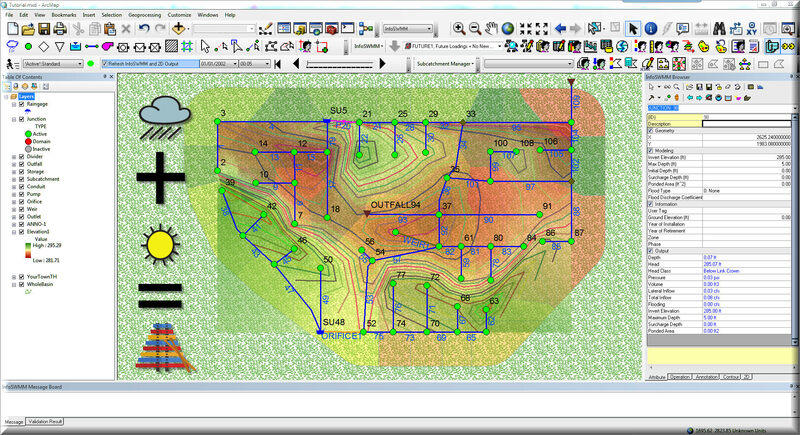 InfoSWMM H2OMap SWMM InfoSWMM SA’s four summary reports (Highest Continuity and Time Step Critical Element, Routing Time Step Summary, Continuity Runoff Quantity and Continuity Flow Routing) summarize overall results for the 10-yr simulation. The runoff continuity error is -0.512 %, the flow routing continuity error is –1.216 %, and no flooding occurred within the conveyance network (listed as Internal Outflow in the Continuity Flow Routing report). This is expected because the conveyance system in Example 3 was designed for the 100-yr storm. The Continuity Runoff Quantity report shows the significance of evaporation in the total water budget. Almost 20 inches of water were evaporated from the depression storage surfaces of the catchment with another 1.3 inches evaporated from the pond (Flow Volume Difference from Storage Summary report divided by total area of Subcatchments); this corresponds to 18 % of the total rain over the 10 years (110.35 inches). 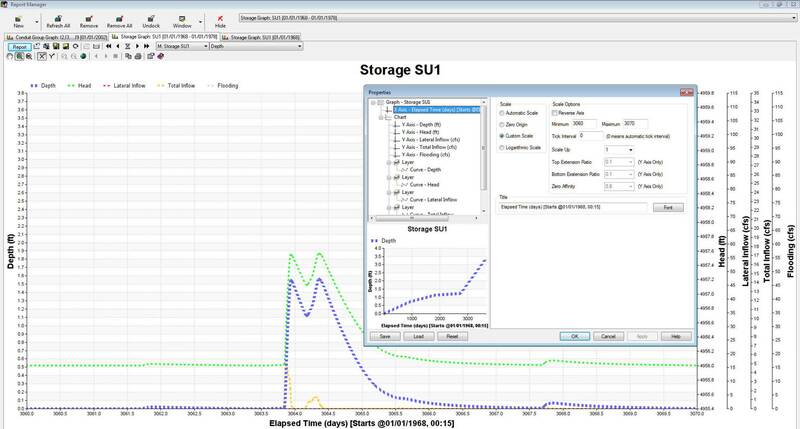 Running the Field Statistics tool on the Total Inflow column of the Storage Graph report for SU1 shows that the maximum flow rate into the detention pond was 31.1 cfs. The outflow from the pond never exceeded 8.3 cfs (determined by using the Field Statistics tool on the Total Inflow column of the Junction Graph for junction J_OUT). This control occurs over a period of 37 minutes, given that the maximum inflow to the pond was at 12:00 AM of day 2781, while the maximum discharge was at 12:45 AM of the same day. Note that the maximum flow entering the pond is much lower than the initial estimate for the 10-yr storm computed in Example 3, 62.1 cfs. Interestingly, however, the maximum discharge Release by the pond in the continuous simulation (8.3 cfs) is somewhat larger than 7.34 cfs, the 10-yr peak discharge target used in Example 3. In other words, even though the peak flow entering the pond during the 10 year record is lower than the design value, the peak outflow is actually larger than its original design value. To explain this result, consider Figure 9-3 which shows the rainfall hyetograph for the storm event that produced the maximum inflow and outflow from the pond. The volume of rain that falls in the first two hours is 1.83 in. This is larger than the 1.71 in associated with the 10-yr 2-hr design storm used in Example 1, yet the inflow rate into the pond is smaller (31.1 cfs versus 62.1 cfs). The main reason for this discrepancy is the different rainfall interval used for the two storm events. The 10-yr design storm used a 5 minute interval and its maximum intensity was 4.87 in/hr (see Figure 1‑6 in Example 1); in contrast, the rain interval for the storm from the continuous record is only 1 hr and its maximum intensity was 1.47 in, 30 % of the maximum intensity of the design storm. This difference explains the considerably smaller peak runoff discharged into the pond for the continuous simulation. The aggregation associated with larger rainfall intervals is a critical issue in continuous simulation that affects the performance of the model significantly. Peak discharges are very sensitive to high rainfall intensities, which typically occur in short periods of time. These high intensities are lost when data are aggregated in larger time steps, and the peak discharges are not well simulated. It is strongly recommended to use rainfall records with fifteen-minute or less time resolution, if available. The difference in maximum intensities does not impact the peak discharges Release by the detention pond. As previously mentioned, the highest peak flow discharged by the pond in the continuous simulation was 8.3 cfs, slightly higher than the 7.34 cfs peak produced from the 10-yr design storm. This is consistent with the fact that the storm associated with the continuous simulation peak is larger than the 10-yr design storm. The attenuation effect of the pond through time is such that the rainfall intensity is not as significant as the volume. One of the benefits of continuous simulation is that the model accounts for the initial state of the catchment and its conveyance network at the beginning of each new storm event. For instance, with continuous simulation the model simulates the initial water depth in the detention pond at the beginning of a new rainfall event. A high water depth will reduce the volume available for controlling the next storm, so that the discharges Release will be larger than for the case where the pond is empty at the start of the storm. Figure 9-4 shows the water depth in the pond over a period of 8 days, from day 3061 to day 3069 (from 5/19/1976 to 5/26/1976). Figure 9‑5 shows the inflow and outflow rates for the pond over the same period of time. Rainfall is also included in both plots. Two storm events separated by 4 dry hours are shown: Event 1 has a maximum intensity of 0.24 in/h and a total volume of 0.41 in. ; Event 2 has a maximum intensity of 0.08 in/h and a total volume of 0.33 in. Despite the smaller volume and intensity of the second storm, the water depth in the pond reaches 1.33 ft, which is larger than the water depth reached with the first event, 1.17 ft. Because of the short dry time in between the two events, the water level in the storage unit has only descended to a depth of 0.80 ft when the next event stars. The storage available to control the second event is such that the smaller peak inflow produced by the second event, 1.25 cfs is controlled to a peak outflow of 0.43 cfs, while the larger peak inflow produced by the first event, 3.91 cfs, is controlled to an outflow of only 0.39 cfs. Figure 9-4. Water depth in the detention pond between days 3060 and 3070. Figure 9-5. Inflow and outflow (Q) for the detention pond between days 3060 and 3070. Finally, another advantage of continuous simulation is the inclusion of evaporation in the overall system water balance. Evaporation from both the pervious and impervious depression storage areas takes place between rain events. Thus, the amount of depression storage available to capture the initial portion of the next storm depends on the interval between storms. As an example, Figure 9-6 shows the rainfall and losses (infiltration plus evaporation) simulated in Subcatchment S1 over the period of time from 5/19/1976 to 5/26/1976. It is seen that after large events, and once infiltration has stopped, the losses stabilize at 0.0021 in/h. These losses are caused by evaporation acting over the water stored on the impervious area. To confirm this, consider that the average evaporation rate in May is 0.12 in/day or 0.005 in/h; the percent imperviousness of Subcatchment S1 is 56.8%, and 25% of that area does not have depression storage. Therefore, evaporation acts over 0.568 • (1-0.25) = 42.6% of the total area, and so the loss rate over the entire Subcatchment S1 equals 42.6% • 0.12 in/day = 0.0021 in/hr, the same as the loss rate shown in Figure 9-6. Figure 9-6. Losses for Subcatchment S1 between days 3060 and 3070. 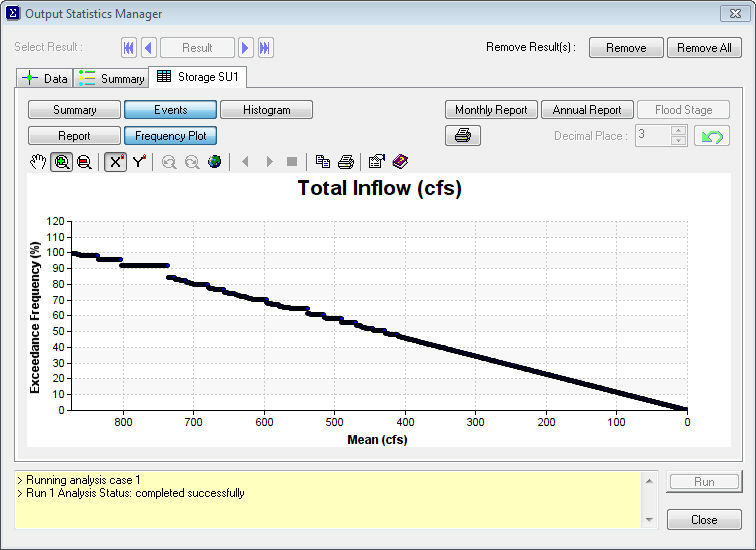 To illustrate the use of InfoSWMM H2OMap SWMM InfoSWMM SA’s Output Statistics Manager tool, a frequency analysis of the peak outflows from the site’s detention pond will be made. The analysis will show how often and for what periods of time the pond has a certain discharge and how the magnitudes of the peak discharges during these periods are distributed. To begin, open the Output Statistics Manager from the InfoSWMM H2OMap SWMM InfoSWMM SA Tools menu. Figure 9-7 shows how the dialog should be filled in for this particular query. The object to be analyzed is node J_OUT since it directly receives the outflow that exits the pond from each of its outlet devices. The variable to be analyzed for this node is Total Inflow. The time period used to define events is Event-Dependent, meaning that separate events will be defined by consecutive reporting periods where certain event threshold conditions are met. Within each such event period, the statistic to be analyzed is the Peak value of total inflow to the node (which is equivalent to the peak pond discharge through all of its outlet structures). And finally, the threshold criteria state that a new event begins whenever an inflow of at least 0.005 cfs occurs at least 6 hours after the last inflow of at least this amount was recorded. The selection of these values will affect how many events are counted. In general, larger values of the minimum flow or larger values of the time of separation will produce a fewer number of events. The report generated by running this statistical query contains four sections as shown in Figure 9-8 through Figure 9-11. The first section is the Summary Statistics, shown in Figure 9‑8. According to this summary, 295 events were identified in the record based on the thresholds values for flow and inter-event time defined for the frequency analysis; these events comprise 13.7 % of the total simulation time. Note the high positive skewness coefficient (4.93) which implies a large number of low discharges and few large ones. This is confirmed by the small value of the mean peak flow, 0.4 cfs. Figure 9-9 shows a portion of the second section of the report, the Event Listing for the variable under study. The events are listed in order of decreasing value of the event statistic (the peak value) for the variable being analyzed (total inflow rate at node J_OUT). Five fields are included: Start date of the event, duration, value of the variable under study (in this case peak flow), the exceedance frequency and an estimation of the corresponding return period. Note the length of the events listed in this table; the majority of them last longer than 24 hours. This shows that discharges are Release quite slowly from the pond, as expected based on its design criteria. Moreover, a similar frequency analysis for duration instead of the peak discharge would show that the mean event duration is 40.7 hours. where m is the event’s rank, nR is the total number of events and n is the number of years under analysis. For example, for the 4th event occurring on 05/23/1971, the exceedance frequency is equal to F4 = 4 / (295 + 1) = 0.0135= 1.35 %, and the return period is equal to T4 = (10 + 1)/4 = 2.75 years. The event listing also shows that during the 10 years of simulation there were 2 events where the peak discharge was greater than the 7.34 cfs value that was computed in Example 3 when the model was run with the 10-yr design storm. This small discrepancy likely reflects the fact that the 10 years of record used here is only one of 29 different consecutive 10-year sequences that could have been selected from the 30 years worth of rainfall data available. The third section of the Statistics report contains a histogram of the event statistic being analyzed, as shown in Figure 9-10. For this particular example it shows what fraction of all the events had a peak flow of a given size. Note how the figure confirms what was said earlier, that the distribution of peak inflows is highly skewed towards the low end of the flow scale. Finally, the fourth section of the report, as shown in Figure 9-11, presents a cumulative frequency plot of the event statistic under study. In this particular example, only 10 % of the peak discharges over the 10-yr period exceed 0.5 cfs, and only 6 % exceed 2 cfs. Note that both the histogram and cumulative frequency plots are just graphical representations of the same information as provided in the event listing. A second application of the InfoSWMM H2OMap SWMM InfoSWMM SA Output Statistics Manager tool to this example will analyze the maximum depth in the detention pond. This will help verify if the Water Quality Capture Volume (WQCV) of the pond was effective in capturing the more frequently occurring storms. Recall from Example 3 that the first 1.5 feet of storage volume was designated for this purpose. The statistical query used to answer this question is shown in Figure 9-12. Note that this time events are defined to consist of all days where the water depth in the pond was at least 0.05 ft deep. The “Daily” option is chosen for the Event Period because the drawdown time for the WQCV is 40 hours; thus a daily analysis of the depth in this portion of the pond is sufficient. Figure 9-13 shows the frequency plot that results from this query. On only 7 % of the days when the pond is wet does its depth exceed the WQCV. Thus, one can conclude that the large majority of all storms are captured within the WQCV and the pond will function as an effective BMP control. Another variable typically analyzed using statistics is rainfall. Several quantities that characterize storm events for the rainfall record used in this example will be examined and compared. These are the event duration, mean intensity, total volume, and peak intensity. As before, the record will be separated into a sequence of independent storm events of varying magnitude and duration using InfoSWMM H2OMap SWMM InfoSWMM SA’s Output Statistics Manager tool. Note that a rainfall analysis can be made without having to run a complete runoff/routing simulation for the entire InfoSWMM H2OMap SWMM InfoSWMM SA model. See the sidebar “Analyzing Stand-Alone Rainfall Files with InfoSWMM H2OMap SWMM InfoSWMM SA” for details on how to do this. In rainfall analysis, the separation time used to decide when one event ends and another begins is referred to as the Minimum Inter-Event Time (MIT). This is the smallest number of consecutive dry periods that must occur before the next wet period is considered as a separate event. There is no established “correct” value for the MIT, although 3 to 30 hours are often used for rainfall data (Hydroscience, 1979). See Adams and Papa (2000) for a detailed discussion on this subject. When storm events are characterized as a Poisson process, the time between events follows an exponential distribution for which the mean equals the standard deviation (i.e., the coefficient of variation (CV) is 1). Thus one suggested approach to choosing a MIT is to find a value that produces a CV of 1 for the resulting collection of inter-event times. Figure 9-14 shows the statistical query used to test how well a MIT (separation time) of 21 hours produces a sequence of events whose inter-event times have a CV of 1 for the rainfall record used in this chapter. The resulting CV (standard deviation divided by the mean) is 214.249 / 206.884 = 1.04, indicating that 21 hours is a reasonable MIT to use for this rainfall record. Next a frequency analysis is made for each of the following rainfall quantities: duration, mean intensity, total volume, and peak intensity. 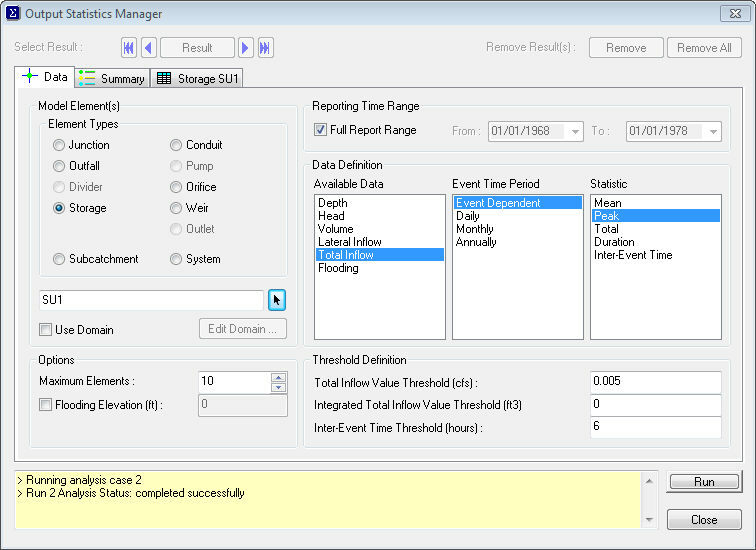 Each analysis uses a Data dialog that looks the same as that in Figure 9-14, except that a different choice of event statistic is used for each. Table 9-2 lists the summary statistics found for each frequency analysis. The first two properties (number of events and event frequency, or percentage of total time in which rainfall is registered) are the same for each rainfall property since all of the frequency analyses used the same thresholds to define an event. 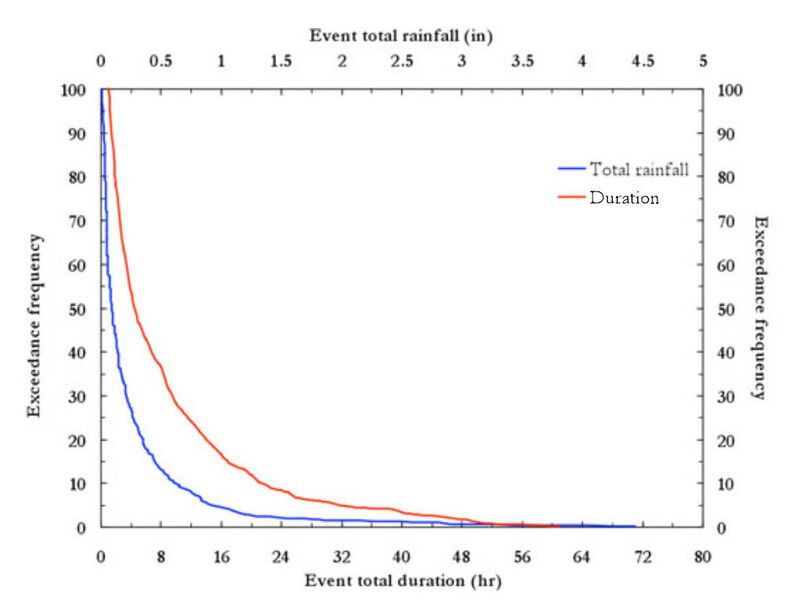 Figure 9-15 shows the frequency plot produced by this analysis for event duration and total rainfall. This plot can also be used as a less direct indicator than the pond depth frequency analysis performed earlier to see if the Water Quality Capture Volume (WQCV) of 0.23 inches is sufficient to capture the majority of runoff events. It is seen (blue line) that about 70% of the rainfall events have a total volume smaller than 0.23 inches. Even if the watershed were totally impervious with no surface retention capacity, the pond would control around 70% of the events according to the model. In reality there are infiltration and storage losses so that a larger percentage of the rainfall events are controlled by the pond’s volume. Finally, note also that long storms are not very frequent, with 50% of them being shorter than 5 hours, and 80% shorter than 14 hours. Storms longer than one day are very uncommon at this recording station located in the Colorado foothills. Another use of this type of multi-variate statistical analysis is to study in more detail the correspondence between the frequencies of the events based on different rainfall characteristics. The largest event is not necessarily the longest one or the most intense. It is useful to determine the degree of dependence among storm event characteristics in order to see if these characteristics are correlated or not, and to identify a subset of the most critical events that could be used for design purposes, depending on the objective of the analysis. The intensity of the events is significant in determining peak discharge, but the magnitude may be more important when storage control structures are designed or evaluated. Table 9-3 shows the ten most extreme events according to the four characteristics under analysis: duration, mean intensity, volume and peak intensity. The table reveals that the peak and mean intensities are closely correlated; seven of the ten events with the largest peak intensity are also in the groups of events with a large mean intensity (dates of these common events are underlined). There is also a correspondence between duration and total volume; four of the longest events are also in the group that contains the largest ones (the dates of these common events are in blue). A weaker correlation is observed between the mean intensity and volume (one common event in a red box), and between volume and peak intensity (two common events in green). Table 9-4 shows the ranks of the common events identified in Table 9-3. Numbers before and after the “&” symbol indicate the rank according to the variables defined in the first row of the table. For example, from the second column, the longest event (61 hrs) is also the third largest event (2.98 inches), the third longest event (51 hrs) is the eighth largest event (1.66 inches), and so on. Note that the two common events identified among the most severe in terms of the volume and peak intensity are the same two events associated with the largest peak discharges Release by the storage unit discussed earlier; these are the events of 07/47/1977 and 8/12/1975. Finally, there are no common events among the ten most severe in terms of both duration and intensities (both mean and peak). This analysis corresponds to a preliminary step in evaluating the correlation between storm event characteristics. Other methodologies including the use of scatter plots between variables and correlation coefficients can be used. These methods are applied to all the events and not only the most severe ones. Figure 9-16. 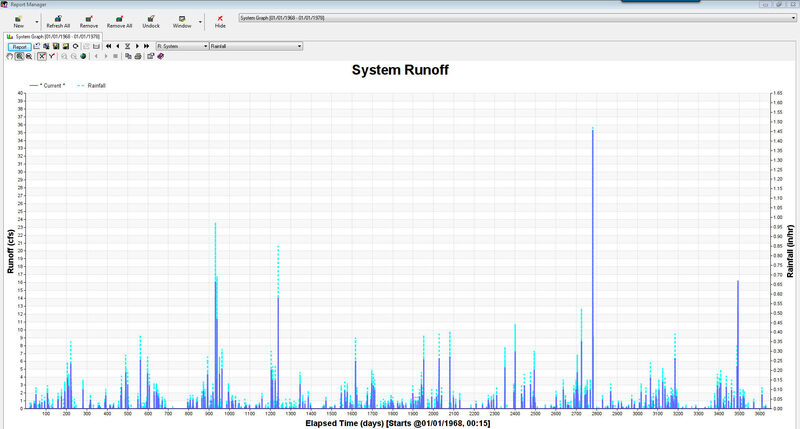 Runoff and Rainfall for the Simulation Period in InfoSWMM H2OMap SWMM InfoSWMM SA. 1. Continuous simulation allows modelers to more faithfully represent the behavior of drainage systems because it subjects them to a long sequence of actual rainfall events of varying magnitudes and durations and also accounts for the variability of antecedent conditions that exist from one event to the next. 2. Evaporation is an important component of the long-term water budget that should be considered in continuous simulation. In this example it accounted for 18 % of the total rainfall input to the catchment. 3. Model setup for continuous simulation is quite straightforward in InfoSWMM H2OMap SWMM InfoSWMM SA, providing that reliable long-term rainfall records and evaporation data are available. 4. High time resolution on rainfall data is required if accurate predictions of peak runoff flows are needed. The hourly time interval of the rainfall data used in this example may cause peak discharges to be underestimated. 5. InfoSWMM H2OMap SWMM InfoSWMM SA Output Statistics Manager tool is a valuable aid in interpreting the large amount of output data that can be generated from a long-term continuous simulation. It was used here to determine how effective the detention pond was in reducing peak discharges and in capturing the majority of runoff events within its water quality control volume. The tool was also used to characterize the properties of the most severe rainfall events occurring over the 10-year simulation period. 3. Model setup for continuous simulation is quite straightforward in H2OMAP SWMM, providing that reliable long-term rainfall records and evaporation data are available. 5. H2OMAP SWMM’s Output Statistics Manager tool is a valuable aid in interpreting the large amount of output data that can be generated from a long-term continuous simulation. It was used here to determine how effective the detention pond was in reducing peak discharges and in capturing the majority of runoff events within its water quality control volume. The tool was also used to characterize the properties of the most severe rainfall events occurring over the 10-year simulation period.